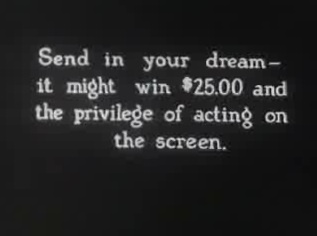 In 1924, the Oakland Tribune and the American Theater invited people to send in their most unusual dreams. The winners got $25 and had their dream made into a short film. You can see one of the winners here. As one commenter writes, it plays like Mack Sennett working from a script by Luis Buñuel. What a great idea. Some media company should do this again.